Remember that dark, grim and twisted side of Berserk that seemed to have receded into the background? Well… It made a pretty strong come back this week, and things definitely got a lot more interesting as a result I’d say. The thing about Berserk is that its most interesting when Guts is taking on demons and monsters, especially ones that link right back to where everything started, i.e Griffith and the godhand. After about a season and a half, we finally had Guts come face to face with a member of the godhand, namely Slan (The whore Princess of the Uterine Sea). We’ve seen Slan once before, although it was more of a cameo appearance than anything monumental. Since this latest anime incarnation of Berserk skipped the whole “Count” part of the story early on, this really is the first time we’ve seen Guts fight a godhand rather than just an apostle. Since the show never really clarified what the difference is between apostles and the godhand themselves, I think its worth pointing out here, since its quite key to understand what’s going on. 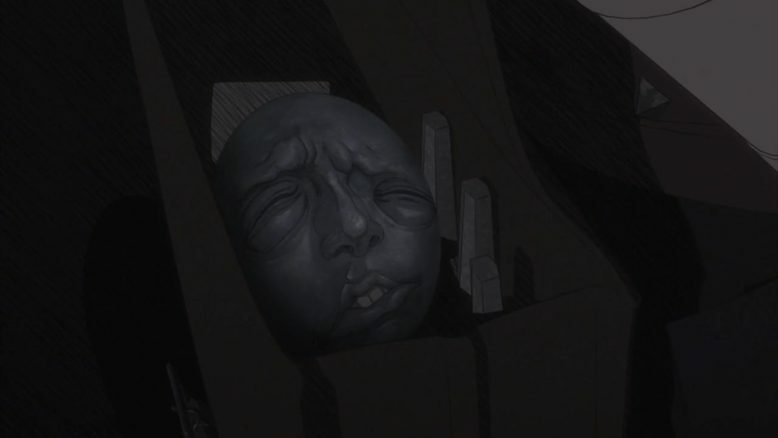 See Apostles are actually humans who’ve used a Behelit (the small face like ball that Guts has, and that Griffith used to sacrifice the original band of the Hawk) and summoned the godhand to achieve their dreams, often sacrificing someone in the process. Griffith is special obviously, because he became a godhand himself rather than an apostle, and what exactly you become after summoning the godhand is determined by what kind of Behelit you have. Enough said, the godhand, which Griffith is now a part of, are the sort of big bad that Guts is fighting against and wants to exact his revenge on. That, is why Slan’s appearance this episode is so darn important, because it puts Guts face to face with one of the five big antagonists of the story. 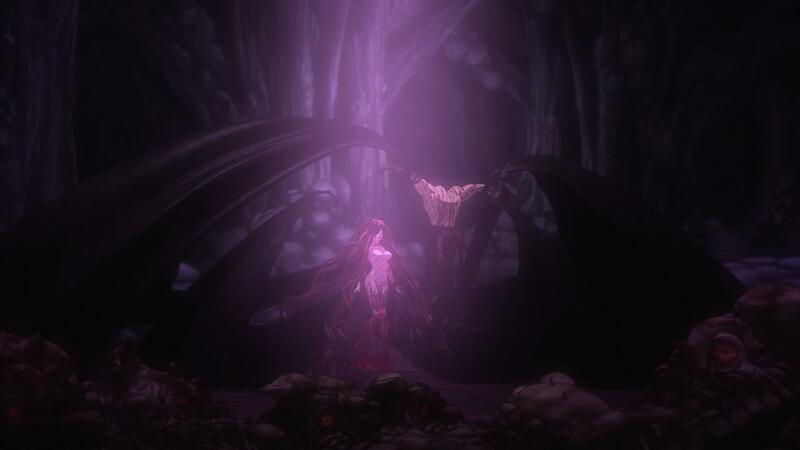 Now, as to what happens in the episode, Guts is in the part of the Astral realm that Slan pretty much holds dominion over, The Qliphoth. What’s notable here is that Slan appears before Guts willingly, and has developed a bit of an obsession over him, which is notable because Slan represents and thrives off of every negative emotion there is. The big thing here is that Slan represents and eggs on the darkness that Guts is fighting against in himself thus far. Slan can’t be killed (since all godhand are seemingly immortal in the world of Berserk), so it seems like her end game is to corrupt Guts as much as she can. The fact that Guts has a Behelit, plays right into it all, as Slan pretty much tempts him to use it and become an Apostle himself in this very episode. Guts doesn’t, obviously, and a lot of that is thanks to the Skull Knight’s rather timely intervention. And I have to say, every time the Skull Knight makes an appearance in the story, things definitely change for the better. It’s beyond epic that the guy has a sword that’s literally made of Behelit, and is able to cut through time and space. So yes, The Skull Knight is definitely a darn powerful being in his own right, but the coolest thing is of course, how he continues to mentor and save Guts every darn time he arrives. In this case, its telling Guts to use his sword to end Slan’s current physical form, which itself has been powered up by how many evil beings and apostles its killed. Its worth noting that like Ishidoro and Serpico, Guts too has a very powerful weapon imbued by a mystical power, the power in this case being the death of all the monsters he’s taken down. The whole “Guts huge sword has power because of all that he’s stood against” is one of the most cool things about the Berserk story, and what keeps it unique. A lot of what Guts has achieved is simply put, based on his own skill, and even the mystical powers that he does have are a result of his own effort. 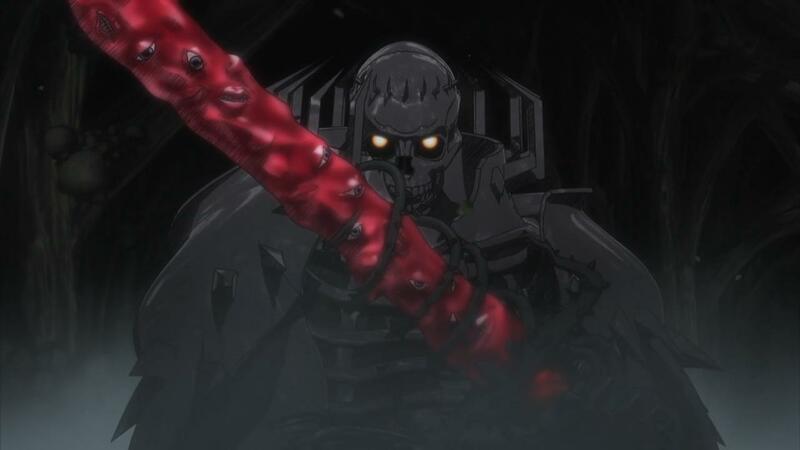 And of course, given that Guts is able to take down Slan with one thrust, shows just how powerful his sword really is. 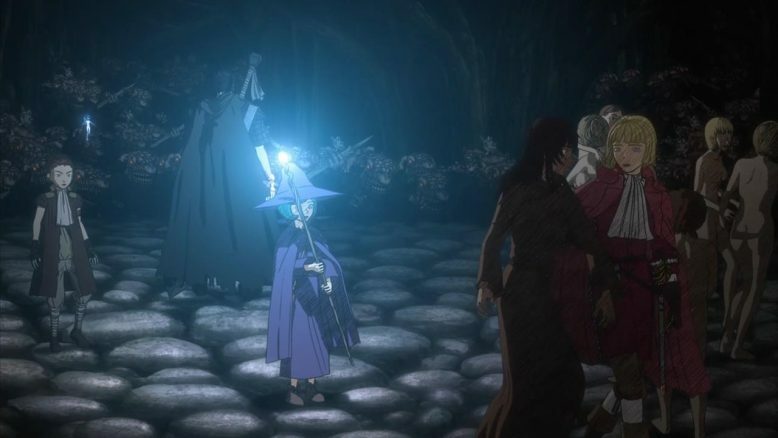 On the other side of this episode is obviously Casca, Farnese, Ishidoro and Schierke, who all get a little development as they work together to escape the cave filled with Trolls. 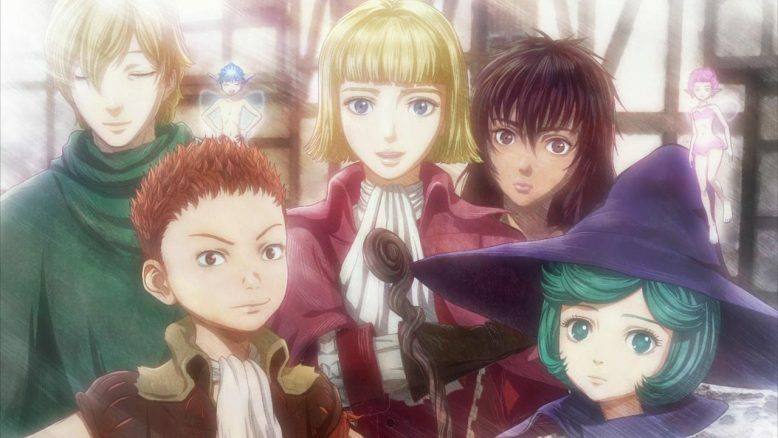 Farnese and Ishidoro in particular, much like Schierke last week, receive words from Guts that not only validate them, but push them forward towards becoming stronger, better people. Farnese for her part, has grown an extraordinary amount, becoming the protector and caretaker of the meek Casca. Ishidoro, for his part, learns to embrace his weakness and even puts himself in harms way to protect everyone else. And at the end of it all, everyone manages to survive and make it out of the cave and the Astral Realm itself, just as the credits roll in. The stuff about Guts and having comrades that I talked about, is more or less confirmed by the story and Guts himself, as he thinks about how he never expected to have comrades again after what happened with the original band of the Hawk. Finally, I have to hand it to the Anime production stuff, animation issues aside, this episode adapted nearly every part of the manga, almost panel for panel, and keep the pacing and story pretty tightly packed within one episode. It makes sense that there was barely any time for a recap at the start of the episode, or for a proper ending credits sequence, because every moment of the episode was used to its fullest. What has me curious now is where Berserk’s latest season is going to end. Things get pretty intense from this episode forward, and there’s barely going to be a time to breath from here on out. There’s a good chunk of story left too, so it’ll be interesting to see where this series chooses to end itself, and what that means for the franchise as a whole.